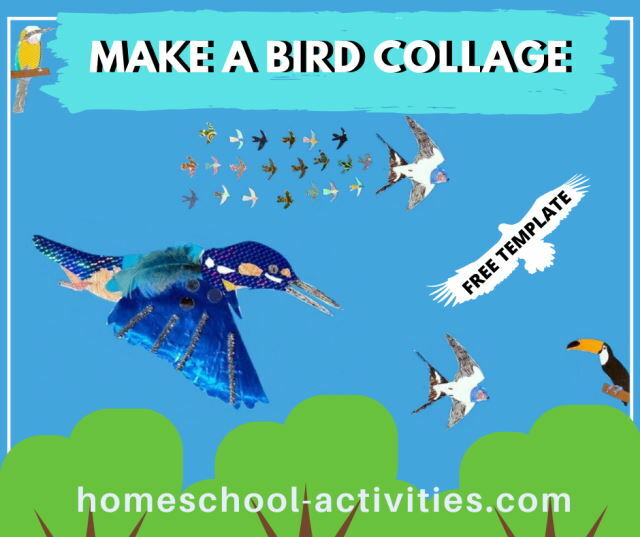 Our home school kids craft ideas are ideal for all ages. There's lots of unusual projects to choose from, like building robots from trash and making an ocean diorama using a shoe box. You'll find crafts offer an amazing learning opportunity to add new interest to Unit Studies. You can borrow ideas from the best of our projects and activities. All these ideas are free and will give you hours of fun. You'll also find they are a brilliant way to learn. In fact you'll cover many aspects of the curriculum without even trying! 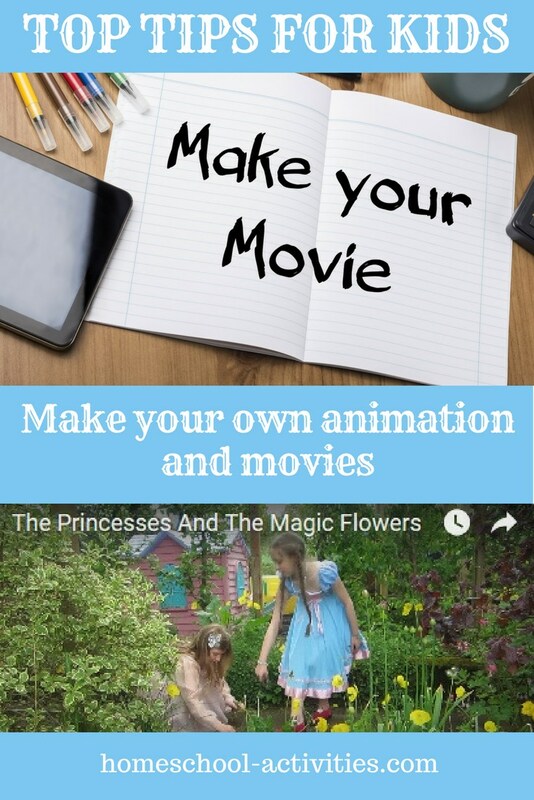 Top tips on how to make your own animation and short films for kids with free apps and a place to share your movies with other children. Kids craft projects start from when your kids are really young with this preschool activity idea. 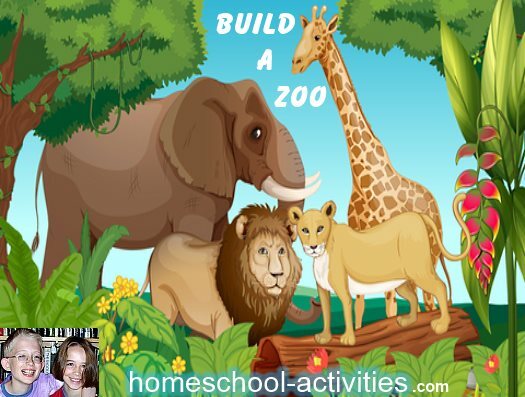 Animals are always a winner and you can be sure your kids will love putting art and crafts skills to use if you get them building their own Zoo. 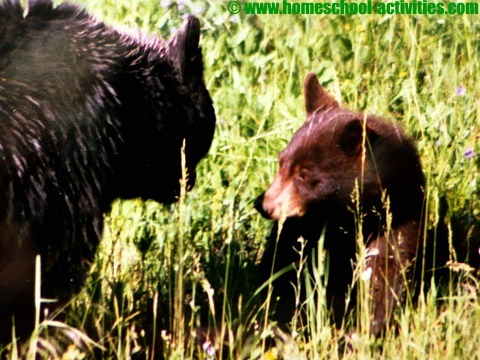 From wooden blocks to cardboard boxes, we suggest all sorts of home school kids craft projects, like an animal hospital and even a Zoo aquarium. 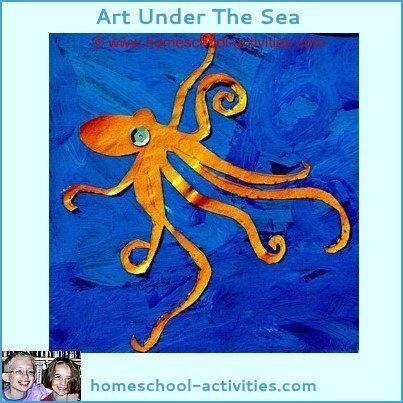 Kids art and craft ideas combine to take you under the sea in this homeschool unit studies Ocean creatures project. From making a sea scene to a shark collage, there's lots of ideas to keep your kids happy - including getting wet! Making robots must be one of the coolest kids craft projects, especially when they cost nothing. 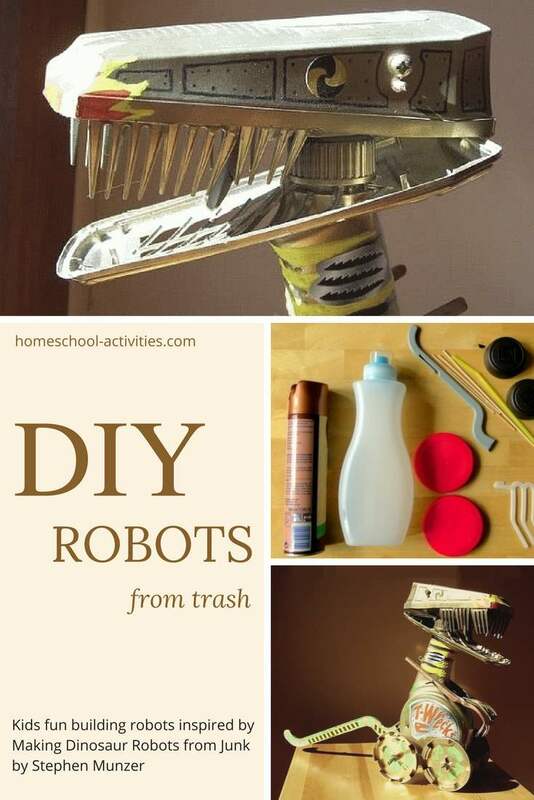 One of our favorite art and craft projects and most popular pages, we show you how to go about building robot droids. 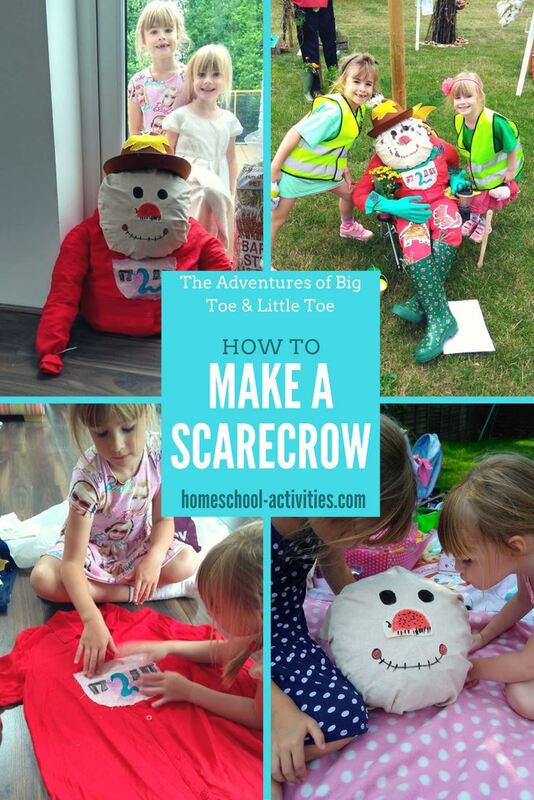 There are lots of reasons to have a go at learning how to make a scarecrow. They are growing in popularity for Halloween and as fall-themed decorations. They also make a wonderful introduction to kids gardening activities! Full of ideas for all ages, we show you lots of art and craft projects perfect for anyone who loves dragon crafts. 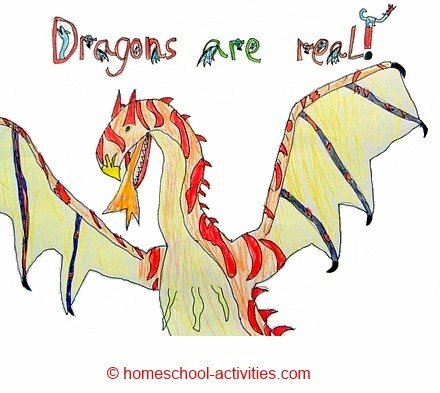 Try making a dragon from junk, dressing up as a dragon and becoming a home school dragonologist. Dinosaurs for kids is one of those perfect kids craft ideas which bring home school science to life. 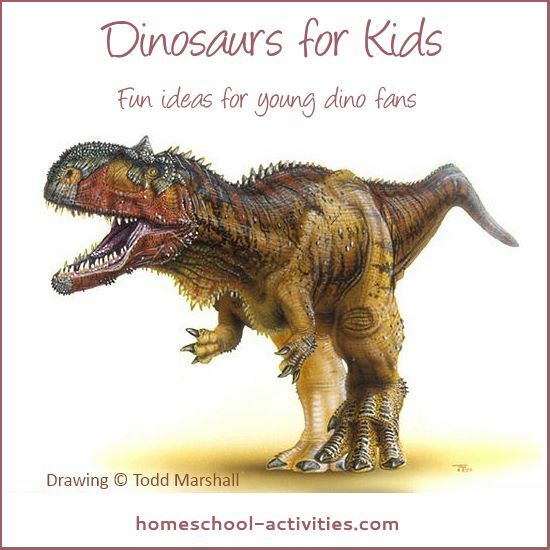 If your kids love dinosaurs, see how you can use your art skills to create a dinosaur scene full of your favorite chums. You can even get your kids marbling their own dinosaur egg. One of those great kids crafts which helps save the planet by getting you to use up household junk! 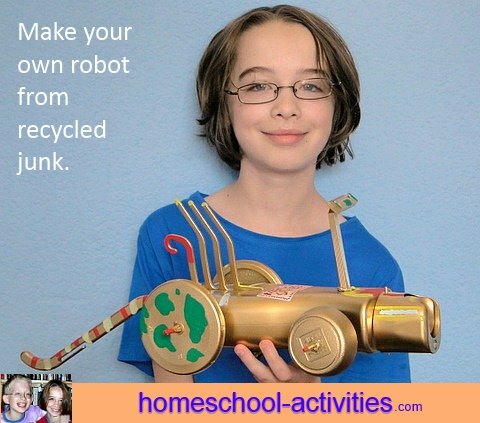 See how my daughter Catherine has made inventive use of coat hangers, aerosol can lids and barbecue sticks to create her own home school robots with recycled crafts. This is a lovely bird crafts art project with free printable templates so you can make your own flock of swallows! It's a delightful collage where holographic paper mimics the beauty of feathers. 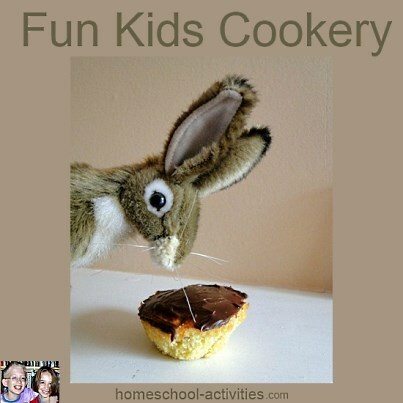 When it comes to kids craft projects, don't forget cookery! You can get a free chocolate fudge recipe - I thought you might like to share one of our favorite home school treats! Fall gives you a perfect opportunity to try out all sorts of home school art and kids craft ideas, especially with all those beautiful leaves lying around. 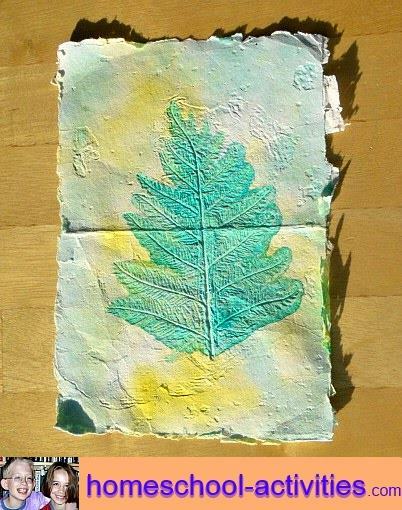 Try making leaf prints and one of our favorite home school kids art projects - an autumn collage in our page on fall crafts for kids. Kids craft ideas are even better when they include slug-less gardening! 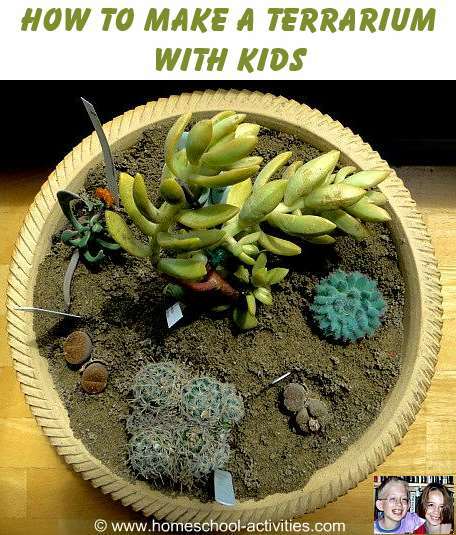 We show you how to make a terrarium for cactus plants and a home for the insect-eating plants with guaranteed child appeal. Kids craft ideas are much more exciting if you include outdoor crafts. 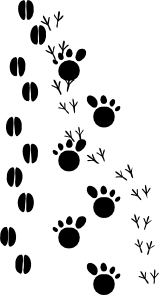 Even from a very young age, your kids can learn animal tracking and how to start a fire - ideas which help you pass on one of the greatest gifts you can give - a love of nature. 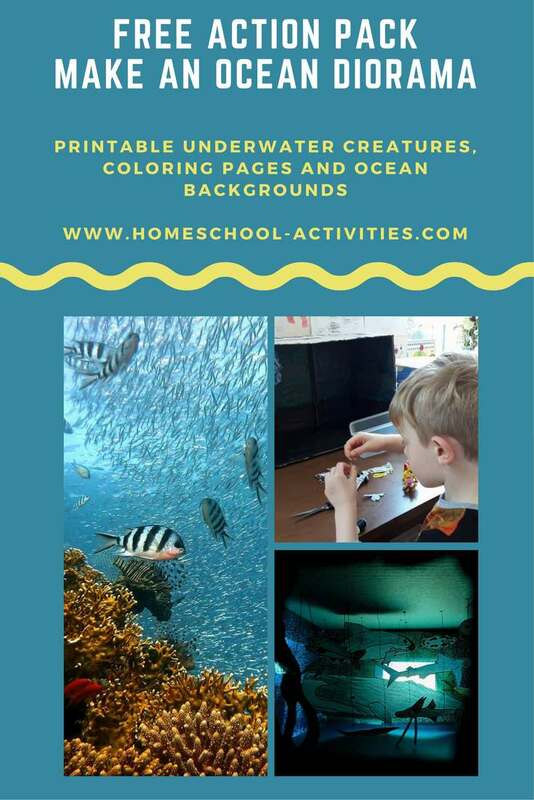 This fabulous ocean diorama in a shoe box is one of those art and craft projects which uses all your talents as you draw jellyfish and whales to hang in their own secret undersea world. A peephole at the back gives you a glimpse of life under the ocean. 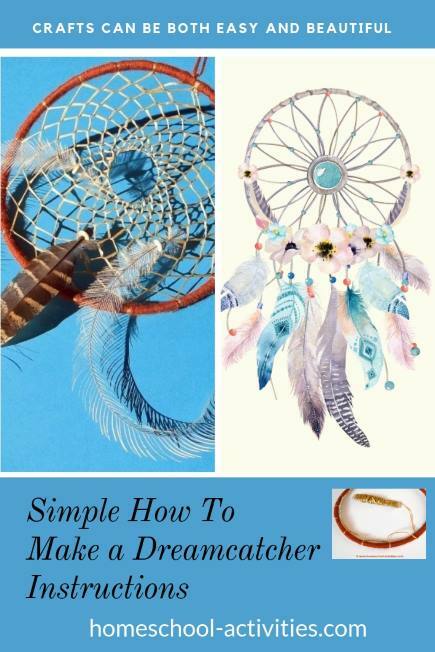 Our easy dream catcher instructions show you that Native Indian crafts can be both simple and beautiful. Wonderful ideas for kids paper mache projects. 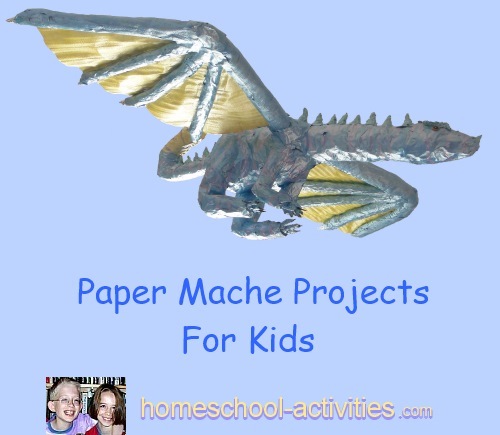 You'll find out how to make this homeschool dragon model as well as everything from paper mache bowls to apples and even an elephant! You'll find lots more kids craft ideas on my site, including needle felting, salt dough projects and animal masks.